Amethystine Python is Australia's largest snake. It is also called scrub python and its Latin name is Morelia amethistina. 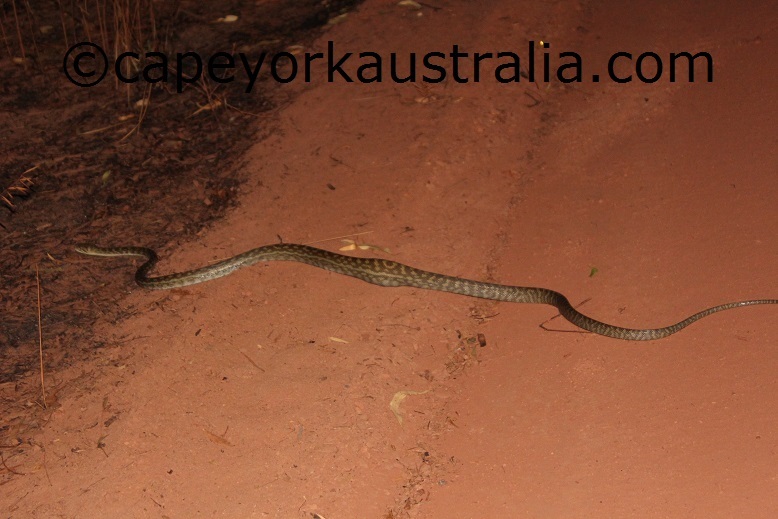 It is only found in this part of Australia - in Cape York and areas just south of it. 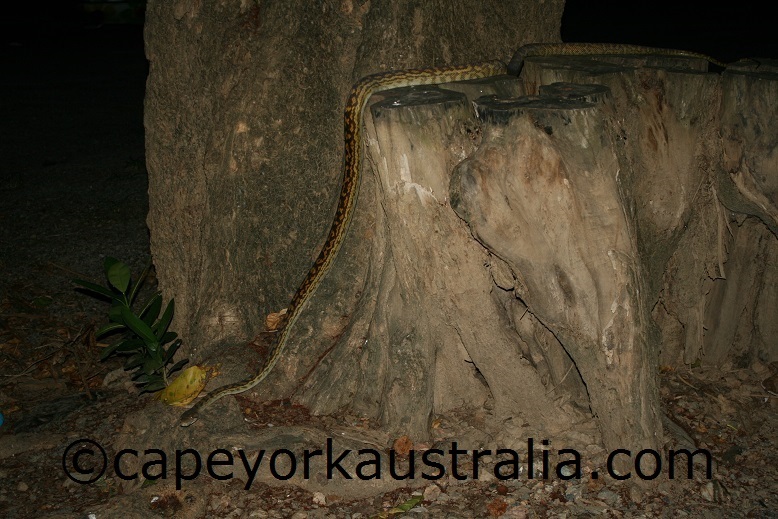 It can grow up to eight metres long however it is more usual to see a smaller one. Like other pythons, it is a non-venomous snake and harmless to humans. And yes, it is the species that got famous when a snake went for a flight from Cairns to Port Moresby (Papua New Guinea) on 11. January 2013. It managed to cling to the wing of the Qantas plane for the whole trip but had died due to freezing temperatures in high altitudes. What Does the Amethystine Python Look Like? The size you most often see is 2-3 metres. 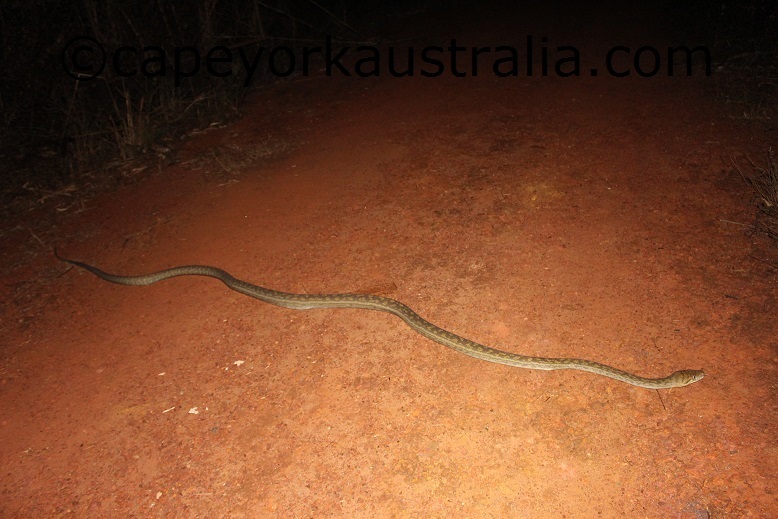 It is slender for its size compared to some other Australian pythons. It has brown pattern on its upper side and a paler belly. The colours turn amethystine in certain light, which has given the snake its name. You can see them basking in the sun during the day time and going hunting during the night time. Unlike our poisonous snakes which always seem nervous and on alert, pythons most often move slowly and calmly. It moves away if you go too close, avoiding all human contact possible. However, the fact that it's not poisonous does not mean that it does not have teeth to bite! It can still give you a bite if cornered or threatened too much, and like most bites it can be nasty and get infected (however not poisonous). The best remedy is to stay away from it and respect it like all other snakes. The fact that it is not poisonous means that it has other means of killing its prey than poisoning (a snake's poison is produced for killing the prey, not for self defence although it ends up getting used for that, too). Being large snakes, pythons kill their prey by suffocating just like boas - their relatives. Amethystine python mostly eats small animals like small possums, birds, bandicoots, rats, frogs, reptiles, flying foxes.. but large individuals do take an occasional larger prey like a wallaby, pademelon or tree kangaroo. Their mating season is our Dry Season (June-September) and female lays up to 20 eggs. She incubates them for almost three months by curling around them and shaking her body to produce heat. Once the eggs hatch, the young are independent and take off after about two days. Pythons are found in tropical and subtropical areas in Australia, Asia and Africa (but are most developed in Australia). Amethystine pythons are found in Indonesia, Papua New Guinea, and north eastern Australia (Cape York as well as the areas around and south of Cairns and Atherton Tablelands, even until Townsville according to some sources). They live mostly in rainforests, but can also be found in vine and monsoon forest, scrubland, bushland, open woodland, particularly in moist areas close to water. And they do come to suburbia. 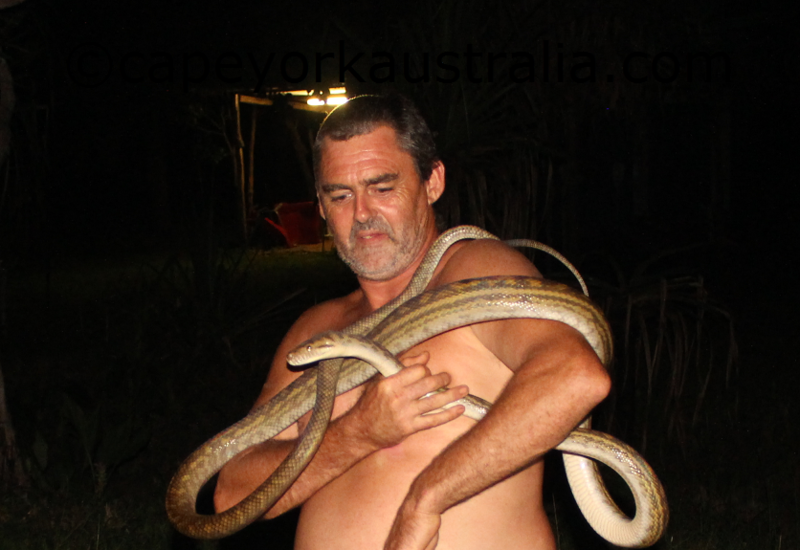 Most of the photos on this page are of a wild amethystine python that I saw near Mulgrave River south of Cairns, just south of Gordonvale (which happens to be the place where Australia's largest amethystine python - eight metres - was recorded). You could also spot one on a croc cruise on Daintree River. Another good place to see it from my own experience is on Atherton Tablelands, in the rainforests around Lake Eacham and Lake Barrine. You can walk around both lakes. They are mostly aboreal but can also be seen on the ground. They are more active night time but can also be seen day time, snoozing and sunbaking to heat their body temperature. If you don't see any on the lake walks, you can take a cruise on Lake Barrine, they often spot them in the tall grass just on the edges of the lake (check that tall grass on the walks too). Talk to the cruise operators and ask if they have seen one today.